Sick of applying falsies? Try these pro tips. As much as we love a good set of false lashes every now and then, they are not practical for every day. So if you don’t have naturally long lashes, what can you do? Thankfully there are lots of expert tips and tricks you can use to help them look fuller and longer. If you don’t already own one, get yourself an eyelash curler. 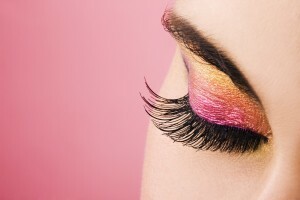 A good eight second squeeze to your lashes before mascara will get them looking curlier and more voluminous. After your first coat of mascara, use a cotton bud to apply baby powder to your lashes. Add another layer or two of mascara over the top. This is a simple trick that adds thickness. Also known as ‘minking’ this trick involves using two different coloured mascaras. Try using black with brown at the tips. The mix of colours gives the appearance of fuller looking lashes. As tempting as it is to add coat after coat of mascara, try not to go overboard. Using too much mascara will just result in a clumpy and messy appearance. Try to use less product, but take more time in your application. A tip all the pros swear by; when applying your mascara, wiggle your wand in a zigzag motion at the roots of your lashes. This separates the lashes, making them look longer. When you want your lashes to take centre stage, try tightlining. This is when you use your eyeliner to line your upper waterline. You could also use your liner to fill in the gaps between the roots of your lashes. These techniques help your lash line appear fuller, giving the appearance of thicker lashes. A lot of beauty lines are releasing mascara primers. These are applied before your usual mascara and can make a big difference in terms of length and thickness. To keep your eyelashes healthy, you need to look after them! Sleeping in mascara can cause them to break or even fall out. Be sure to remove eye make-up (and the rest of your make-up!) gently before going to sleep. Another alternative to false eyelashes is eyelash extensions. These last longer than false eyelashes and have a more natural appearance. Find out more, and book an appointment on our eyelash extensions page. View and comment on the original Top Inspired article.